I’m a member of a theologically conservative United Methodist group on Facebook. 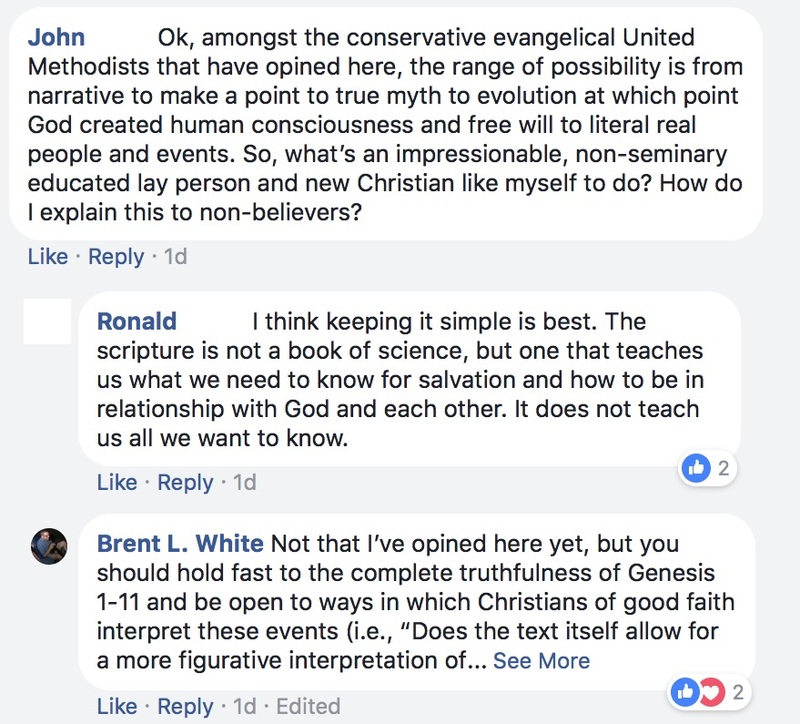 Yesterday, a member of the group, perhaps a student in seminary, said he was uncomfortable with the idea that Genesis 1–11 should be viewed as a “true myth.” Everyone in the group shared his discomfort, although there was little consensus on the extent to which these chapters report literal history. Notice I said “the extent to which”: no one denied that they were historical to some extent. So, what’s an impressionable, non-seminary educated lay person and new Christian like myself to do? How do I explain this to non-believers? Be charitable toward brothers and sisters who disagree with your position, wherever you land on the question. Don’t be overly impressed with the latest scientific theory, whatever it may be. It will be overturned by some later theory. This happens all the time in science. When it comes to questions of origins, there is often a lot speculation and guesswork based on little hard evidence. I believe, by contrast, that the Spirit inspired the Bible’s authors to write in such a way that the Bible’s truthful accounts could be understood by people of all times and in all places. That’s part of its genius. An abstract thing called “science” doesn’t “say” anything, despite what’s usually reported in the media. Nearly everything we think we know within the realm of science is contested by specialists all the time. Most of what most people know about evolution and cosmology they learned in a ninth- or tenth-grade textbook: which is to say, they know next to nothing, personally, about these things—including the most stridently skeptical voices speaking against the historicity of the Bible’s early chapters. Nearly everyone “takes on faith” that evolution, for example, happened in a particular way. Ken Ham, to his credit, the most stubbornly “young earth” of young earth creationists, knows far more about evolution and cosmology than the vast majority of people who disagree with and vilify him. Also, for people who do interpret these chapters more figuratively, please concede that there’s no harm whatsoever in interpreting them more literally. I wish I hadn’t mentioned Ham! Whether he has scientific credentials or not, the fact remains that he knows far more about the science of whence he speaks than I do—having learned what I know in long obsolete high school science textbooks. I don’t doubt that a scientifically minded person like Nye could have understood the scientific literature before he came to the debate. But it sounds like [based on what I’d heard from a progressive friend who despises Ken Ham and watched the debate] that Nye didn’t bother to prepare for the debate the way Ham did. I’m a Ramblin’ Wreck from Georgia Tech with an electrical engineering degree. (I took a lot of physics classes, for whatever that’s worth.) I’m no scientist, but if we have to relegate all scientific opinions to the credentialed experts, then let’s not bother ever saying anything about scientific questions. We’re not qualified. Certainly not Methodist ministers, many of whom are eager to say that the Bible can’t be trusted on these matters. My point remains: even Ken Ham can know far more about these questions than the vast majority of people who disagree with him. So, even the Ken Hams of the world are not wrong to sound that particular alarm—however much we disagree with their zeal for YEC advocacy. This entry was posted on	March 9, 2018 at 1:48 pm	and is filed under Uncategorized. If it were actually the case that “all scientists” for “all time” interpreted the physical universe in a certain way based on actual application of the “scientific method,” I might have some pause in ruling them “out of school” when considering the proper interpretation of Genesis. Of course, as you point out, that is never the case. Hardly a month goes by but what the press reports some “new discovery” which supposedly radically revises the scientific “dogma” of the day. And the “scientists” even “interpret” such data contrary to each other. For example, “punctuated equilibrium” is totally inconsistent with “classical Darwinism.” Yet “all scientists” continue to assert that “biological evolution” is an “established fact.” This shows that the “established fact” statement is simply devoid of any actual substantive content. Further, when it comes to how Christians should react to “claims of science” in deciding how to properly construe scripture, we should take into account that most of the “leaders” who espouse evolutionary theory are atheists. So why should we believe them? Not for nothing does the Psalmist say, “The fool has said in his heart, ‘There is no God. '” Thus, in devising their theory of origins, they simply reject any possibility that there is any God to have anything to do with how things came to be how they are. God could never have “intervened.” Can any proper science result from such a false premise? In logic, a false premise generally results in a false conclusion. And so it does in science. Moreover, generally speaking cosmological “scientists” cannot base their “origins” theories on the “scientific method.” They can’t rely on “observations” or “experiments” or “replication” to sustain “Big Bang.” They’re just speculating. 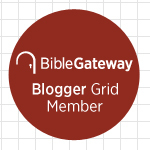 So, my conclusion is that there is no good reason why I should defer to any “scientific” claim in reaching the proper construction of scripture, including Genesis. If you think about it, since science is constantly changing, our view of what Genesis means would be constantly changing as well. Instead, I think we should rely on a basically straightforward reading unless the overall scriptural text itself suggests some different reading. That said, I long ago stopped participating in the “argument between science and the Bible”. It’s a straw dog. For me, science is what God’s created man does in seeking to explain in “scientific terms” how God did what God did. I am probably simplistic, but I look at the Biblical creation story as the first parable of the Bible. God is telling a simple story of how he created the Universe and all that’s in it, that could be easily understood by readers of of any age (time). The purpose was not scientific, but rather to introduce the story of God’s relationship to man and vice-versa. The story of sin and redemption. The story of God’s great love, God’s mercy and grace, and God’s long suffering patience with us. That doesn’t mean that Adam and Eve were not real people. I believe that they were. Just as I believe there was a man named Job. One final note. Isn’t it odd that a “genius” like Hawking thinks that we could make Mars habitable, but we couldn’t clean up a relatively little climate change here, if it is in fact happening? I think that what Lewis said is closer to my thinking. Please note that I said that Adam and Eve really existed and that is necessary for the “Family Tree” we find in both the Old and New Testaments. This is why I don’t like to even enter this debate. I’m very comfortable with my own “Biblical understanding”, and don’t feel any great urgency to convince anyone of anything. I believe That GOD created it all. I believe that GOD is in control of all history and of the future. The story of man’s fall and God’s redemption plan is the story that matters to me. Great discussion. I came here from Methoblog and I’m surprised they allowed it. I come from the “Genesis wasn’t meant to be read as a science text” group. Could the earth have been created by God in 7 24 hour days? Of course, God being sovereign over His creation. Was it? I’ll go with Occams’ Razor here, the simplest explanation to me is an old earth based on geology and the cosmological processes used to form the stars and planets. Why would God make things look old just to confuse us? In any case, I just don’t worry about it too much. One of the best books I read in a college religion class was “The Structure of Scientific Revolutions” by Thomas Kuhn. It shows that scientists are not the dispassionate, human calculators popular culture assumes them to be. They are emotional, invested in their own areas of expertise, and emotionally cling to them. The worst thing that can happen to them is to have their life’s work and reason for getting tenure and funding overturned by novel, new work. Even Einstein was emotional about quantum mechanics; e.g., his “God does not play dice with the universe” statement. I read Kuhn’s book in a philosophy class at Georgia Tech! Thanks for reading! I would like to make just a short comment about your position, Dan. Could God have taken eons of “evolutionary development” before getting to the point of man? Certainly. Did he? I suggest Genesis is not amenable to this interpretation. As far as “make things look old just to confuse us,” consider this. If God created the universe “full grown,” and you happened upon a “full grown” tree, would you think God was “fooling” if it had tree rings commensurate with its girth? Would you think that God was “fooling” when you happened upon Adam as a “full grown man,” instead of sperm floating around in search of an egg (in what?). Is it “fooling” to have gold and iron ore in the earth’s crust when created that way, instead of somehow “evolving” into such a condition? I don’t find the evolutionary regimes compelling in all events, but at the least I don’t feel that God can be charged with “fooling somebody” by creating the universe in a “full grown state.” And particularly he hardly can be charged with “fooling” when he expressly states how he did it in his written revelation to us. I’m going to fall back on the 4 legged stool of the UMC, scripture, tradition, reason, and experience. I don’t think scripture says that the universe was created in 6 x 24 = 144 rotations of the earth. Before the earth was created, what was a day anyway. My reason and experience in physics and cosmology says the universe is about 13-14 billion years old. The available evidence points to this fairly clearly. I’m not saying that this view of the universe will not be overturned in the future, but it’s the best view we have now. If Ken Ham and other creationists have an alternative explanation, please point me to it. I would be genuinely interested in learning their point of view. To pick up on your tree example, it can be shown that trees which create rings create approximately one per year. If you take a core of a tree on Year X and then come back 20 years later, you will find 20 more rings than your previous core. So are you saying a tree with hundreds of rings may not be hundreds of years old since God created it full grown? Why would God do something like that where it clearly conflicts with the experience we have dealing with how tree rings relate to the age of a tree? The tree is the “least good” of my examples. What about Adam being an “adult” coming out the gate? Also, what is problematic about the earth simply being created “as is,” with the gold and silver, etc., already being in the ground? And what about the stars simply being created in their present form? Evolution tries to “measure backwards” to “nothing” because that is all it can do–no God to “create” at whatever “stage” of things that he might choose. Point being, there is simply no reason that a Christian has to “measure back to zero.” There are all sorts of specific problems I have with respect to particular tenets of evolution, but don’t have time to run through all those presently. I am saying it is just not scientifically problematic for a creationist to believe in “full grown” creation to start with. Again, how can anyone say God is fooling them that way when he says what he did? For what it’s worth, Hebrew scholars say that the words used for “Created” and “Let there be” when used together like this also carry the meaning “out of nothing”. Dan, I have a few minutes here, so I thought I might mention a few problems I have with evolution (particularly atheistic evolution, but I am not sure theistic evolutionists are in a lot better shape by agreeing with the atheists, only adding, “But God was behind it all.”). Is it not contrary to the law of gravity for the entire universe to be cooped up in a singularity, and then “expand” to the tune of umpteen times the speed of light at the outset? Doesn’t the presence of black holes argue against that? And why isn’t the speed of light limit on acceleration of mass a problem? I read a book by one atheistic astrophysicist at Oxford or Cambridge who AGREED that the speed of light was the “speed limit”, but said this was different because it was merely a matter of the universe itself expanding, and what was inside was merely being “taken along for the ride.” How sensible is that? OF COURSE matter would still be accelerating from one point to another at in excess of the speed limit, whether “along for the ride” or otherwise. And at what point would the speed limit “kick in,” if it was not applicable from the start? Then consider also the incongruity between that high-speed expansion and the supposed contraction of such high speed particles (and “dust,” wherever that is supposed to have come from) into stars. Did everything “slow down” to such a great extent that these particles would exert such a high level of gravitational pull so as to “collapse” into stars? Isn’t the universe itself supposed to still be rapidly expanding? Why weren’t the particles still “carried along”? Moving from stars to planets, is it really reasonable to suppose that there were these “toss-outs” into spherical objects at vastly different places in the solar system, and at that some huge ones going out quite a long ways and others smaller nonetheless not going nearly so far? Is that also consistent with gravity? And why spheres? There is a lot of “space debris” that is not spherical. Why are planets (and moons, themselves “toss-outs” from the planets, supposedly) different? Moving to the earth, how is it that there is such a HUGE chemical variety on earth, and not in the stars or the other planets or moons? And where did “dirt” come from? Why would that be “just so” as to give rise to an even more huge variety of life? And speaking of life coming from inanimate matter, what would cause that? Isn’t that against the law of no spontaneous generation? We certainly don’t see such things now. Why “once upon a time”? To believe in evolution is, in my estimation, far more a “leap of faith” than belief in a Creator God. Evolution has phenomenal “magic” without any magician. At least with God, it makes sense that things could be as they are. Why is this an issue for me? Because as long as atheists believe the universe could have gotten here by such a “natural process,” they are less likely to believe in and turn to God. If they come to see that there is no way to have gotten here without a Creator, then maybe they would come around. I have problems with evolution too. One can clearly see micro evolution in things such as bacteria developing resistance to antibiotics, but macro evolution, where entirely new species arise is on much shakier ground. As for development on a cosmological scale, I do not, at this point, believe in a young cosmos and young earth. I’m perfectly willing to be convinced by new research, but I read what’s on Answers in Genesis and they do not present a persuasive argument in my opinion. To read Genesis as a physics text is just plain wrong as far as I’m concerned. Of course God created everything ex nihilo, and is sovereign over all his creation, but I am not OK with trying to fit cosmology into a straight jacket of what was intended to be grand and poetic language praising God for his creation in Genesis. As for soteriology for atheists, what they learn about the Creator and His creation is not going to make them come around. Unless the grace of God and the power of the Holy Spirit chooses them for election, they will not receive the gift of faith and believe. One comment as to your last about soteriology. While it is true that “no one can come to God except the Spirit draw him”, it is nevertheless simultaneously true that “we beseech you in Christ’s stead, be reconciled to God.” God uses us as his agents in doing the “drawing.” Given that we do not know whom will be chosen and whom not, it behooves us to reach out to everyone with “an answer for the hope that dwells in us.” So, I do think it is profitable to be able to “undermine” a belief in evolution so that they may be forced to consider the alternative.